A clock that is counting down the to the start of the 2014 Boston Marathon at the site of Marathon Sports. The door of Marathon Sports on Boylston Street in Boston was open to let in the warm breeze on what was turning out to be a beautiful early spring day. It was the afternoon of April 15, 2013. Outside the doors of the shop, thousands of spectators lined the sidewalks to cheer on the runners finishing the 117th Boston Marathon. 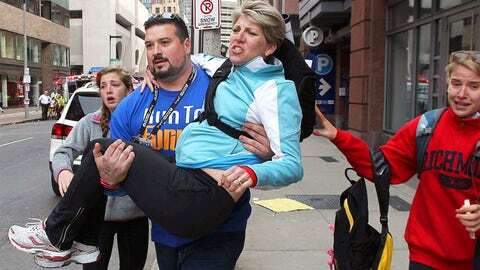 Shane O’Hara, store manager of the Boylston Street franchise of Marathon Sports, was in the middle of helping a customer with a pair of shoes when a bomb exploded directly in front of his store, turning the peaceful afternoon into a mess of smoke, debris and injured people. 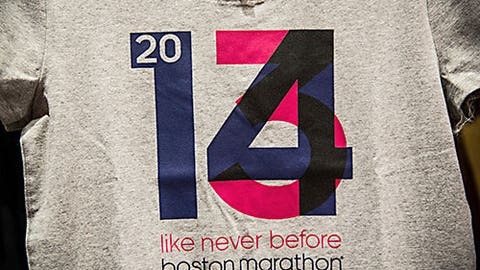 A Boston Marathon shirt sits for sale inside Marathon Sports. O’Hara and his staff spent much of the afternoon helping as many people as they could until medical personnel arrived on the scene, but as the sun set on Boylston Street, Marathon Sports transitioned from a triage station to part of a 12-block crime scene. The FBI and Boston Police spent a week combing the bloodied streets and stores before allowing clean-up crews on the scene on April 22, one week after the bombings. The crime scene was officially lifted on April 24, and most of the areas business and restaurants went back to work that day. Marathon Sports, which suffered some of the heaviest damage of any shop in the area, needed more time. Necessary repairs included replacing the store’s carpet and blown-out windows, but the store vowed to come back as quickly as possible. It kept its promise as it opened for business one day later. A new carpet or a fresh coat of paint could not erase the memories of what happened, especially not with reminders as obvious as the section of fresh concrete cordoned off by four orange cones right outside the door, which marked where the bomb blew apart a chunk of the sidewalk. Many people who were near the finish line on Marathon Monday had the choice to avoid the area until they felt comfortable returning, but for businesses that had to get back to work, staying away was not an option. Although every day at work was a reminder of what the Marathon Sports staff had seen and done on Marathon Monday, O’Hara and his staff also had a front row seat to view the best of Boston. In the weeks after Boylston Street reopened, some of the more than 5,000 runners who were not able to finish the marathon due to the bombings returned on their own to run those last few miles. When they reached the finish line, police details on Boylston Street would stop the notoriously aggressive Boston traffic so runners could take photos of themselves at the finish line. 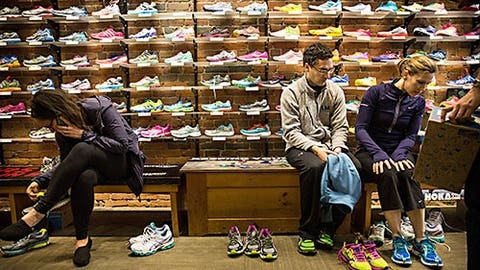 People shop for running shoes inside Marathon Sports. Marathon Sports also saw plenty of support inside its store. The business donated 26.2 percent of its proceeds from any Boston Marathon or Boston Strong apparel to The One Fund. On the first day back after the marathon, the store raised $20,000, and according to brand development manager Dan Soleau, the amount of money raised to date from apparel sales alone totals more than $120,000. Due to its proximity to the first bombing, the store became a sort of memorial where people would leave wreaths or marathon medals or running shoes on the sidewalk as a tribute to the bombing victims, and both the inside and outside of the store was packed with a constant stream of people who wanted to pay their respects. “Numerous people were putting flowers down inside of our store, standing in front of our store, saying prayers in front of our store,” O’Hara said. “It was like that all the time for the entire month. We had more and more people taking pictures outside of our store than I think I’ve ever had at a wedding even. “They were buying anything and everything that we had of the Boston Marathon apparel that was left over –shoes or shorts or shirts, anything that they could do not necessarily just to help us out, but to support everyone and anyone that was injured. 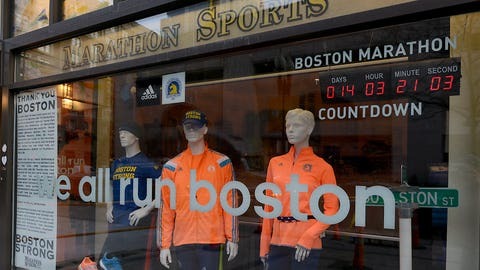 One of the ways the store continues to rally is by managing a team of 50 runners – O’Hara included — who will run the 2014 Boston Marathon to support The One Fund. Each team member is an experienced marathon runner who was tasked with raising $8,000 for The One Fund, but with some runners setting fundraising goals as high as $75,000, the team has raised more than $340,000 within two months of its founding. Although visible scars — like the newness of the concrete patch on the sidewalk — might fade, the emotional ones remain. Marathon Sports is still working out how to handle the staff members who will not be running on Marathon Monday. While running, fundraising and working within the running community have all been a part of the healing process, the idea of working on Marathon Monday might be a case of too much, too soon for some. O’Hara said the business has already talked to employees who were in the store last year about their personal preferences for working the marathon this year.